Incredible Guest Engagement Ideas for Destination Weddings! Indian destination weddings are week-long festivals – and why shouldn’t they be? There is much reason to celebrate! The love, the coming together of two families, the new relationships and your typical Suraj Barjatya filmy saga! In all of this planning you gotta make sure everyone is entertained through all the lengthy rituals and ceremonies of an Indian wedding. Keeping your guests involved is key here. In Big Fat Indian Weddings like ours – a lot of people get lost in the crowd – use these ideas to make sure each person attending your wedding – whether destination or not, is fully entertained and feels like they are part of the plot. From your Chacha’s father-in-law to your newest, cutest little niece – we’ve got a game plan for ‘em all. With these theme party ideas, table settings and additional entertainment ideas, you can rest assured that your Indian destination wedding will be one for the books! Perhaps the simplest way to get guests involved and excited for your wedding is by setting up a funky photobooth. The funkier – the better! Cute props, beautiful frames and crazy accessories will definitely have all your guests lined up to get some amazing photographs clicked at the photobooth. And remember, with an amusing idea like this one – age is no bar! Arrange a game of cricket, kabaddi or kho-kho between #TeamBride and #TeamGroom and see how excited your friends and family get! Cricket matches, especially like Disha and Rushi’s had everyone cheering, clapping and hoping that their team wins. Making teams and having a face-to-face takkar will surely make your wedding even more exciting not only for you, but your guests too! The whole excitement of an indian destination wedding is in its location – use that to the fullest and incorporate your location theme and turn it into a party. 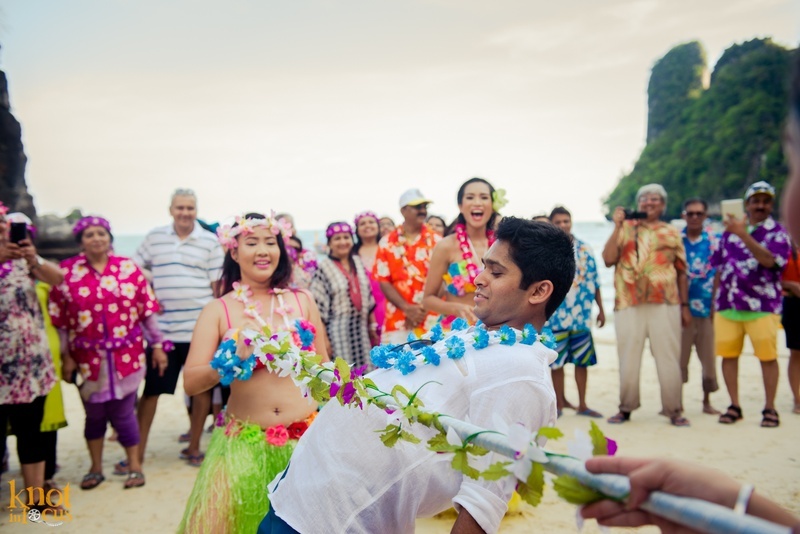 Real wedding couple Pallak and Sidd threw a colourful Engagement Pool Party to match their Goa destination wedding, where Disha and Rushi went for an all-out Hawaiian themed pre-wedding party as well as a Casino party for their international Krabi Destination wedding. These are only a 0.01% of the questions, wedding-bored kids ask – so why not prep a little something for their entertainment too. Print out a wedding coloring book or throw in a bowl of lego at a guarded kids table and you’re good to go! Crayons and Lego never disappoint – believe us! The newest trend in Indian weddings as seen in Pallak and Sidd’s destination Goa wedding as well as Prajal and Sunny’s Pune wedding is the entertainment of a live caricature artist. It not only is amusing for your guests but also acts as a little souvenir / wedding giveaway for them – a little something they will always remember you by.